It’s Halloween again. I’m probably going to play some Rob Zombie and Evanescence later on tonight and lament the fact that I’m far too old to go trick-or-treating. Halloween is not technically a religious holiday, but the very word “Halloween” comes from “All Hallows Eve,” which is the day before All Saints’ Day – the “hallowed” being the saintly. So it does have a bit of Christian significance, but other than that, it’s a secular holiday – and like every other major celebration, it’s become commercialized over the years. The focus is on selling costumes, candy, party favors, decorations, and other items. I think that if the entire world was made of Christians (and I’m definitely not saying it ought to be that way), Halloween would be a day when everyone would dress up as a different saint and go door to door singing hymns. No TPing houses, no throwing eggs or apples at passersby, no horror movie villain masks, and worst of all, no movies like Hocus Pocus or A Nightmare on Elm Street. It would be a little boring. Even though I’m not a huge fan of Halloween, what I like best about the holiday is the Halloween specials of my favorite shows, eating candy, and listening to scary music. And the nice fall weather: hot chocolate or cider, pumpkins and oddly-shaped gourds, multicolored leaves falling, etc. 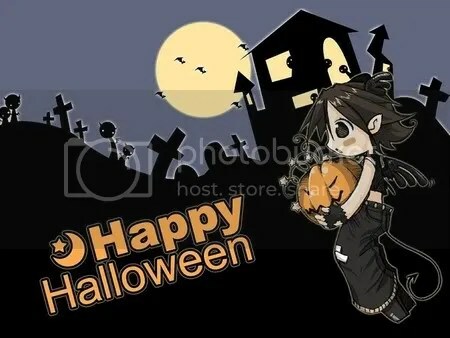 What do you like/dislike about Halloween? What is considered scary music? For me, it’s death metal or screamo. For others it might be Justin Bieber or polka… it really depends on what scares you. The best thing about Halloween used to be trick-or-treating. Now the best thing is using Halloween as a (somewhat) liable excuse to eat insane amounts of sweets and chocolate! That is my favorite part of Halloween… all the chocolate involved! I like witches, black cats, and cauldrons . . . full of CHOCOLATE. Black cats are another of the good things about Halloween. So cute and cuddly! I hate most things about hallowe’en – dressing up, trick or treaters, spiders…. I got scared at work today as everything was dressed up for Hallowe’en!! Ah, yes. Evanescence is always awesome!